Miami, FL- We wrapped up the group C round robin today and had a successful day. We finished the day 3-1 making our round robin score 6-1, tied with Lucy MacGregor from Great Britain. 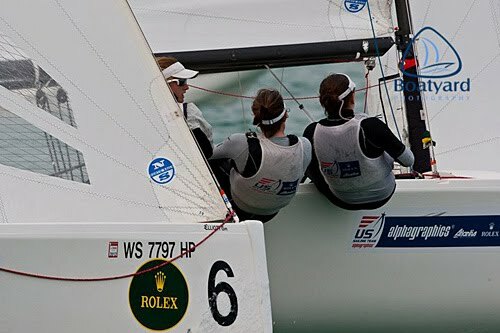 We both advance onto the gold fleet that will seed us for the quarterfinals of the US Sailing's Rolex Miami OCR. We woke up to windy weather this morning and headed out under partly sunny skies to watch the last two races of group B's racing. The wind was up and down, 12-18kts, puffy and shifty. We hopped into our boats around noon and racing got underway soon after that. Our first race and win was against New Zealand's Stephanie Hazard. It was a good close race and got us warmed up and ready for the rest of our races for the day. Our second and third races were against France's Anne-Claire Le Berre, and our USSTAG teammates, Sally Barkow and team, with us taking the win in both races. The last race of the day was against MacGregor, and it was by far our most exciting race of this regatta so far. We had a very good pre-start and we led her off the line after pinning her outside of the race committee boat. Up the first leg we were ahead by about a boat length leading to the right, but misjudged the layline. This put her in a powerful position on our hip and we ended up following her into the top mark. Downwind, we were quite fast and almost got into a position to where we could pin her out past the layline for the leeward mark, but missed a wave. She pulled ahead and soaked down into the zone. We had a better mark rounding than her which gave us more speed, and in trying to round on the outside and force her to tack, we hit her and drew a penalty. But we sailed fast upwind and again rounded just behind her. She had a slow spinnaker set and we were able to jump her and roll over the top of her to take the lead with the chance to burn our penalty. Shortly thereafter, she soaked inside of us so we gybed at her. We luffed, she broached, we caught a puff and a wave and surged ahead by a bit more. We slowed and tried to make a move right at the finish against her, but instead ended up drawing another foul and losing the race. It was a great race and a lot of fun, although our mistakes were rather silly which rather displeased us. Tomorrow we start racing after group A finishes their last race, and the repecharge group completes three of their races. The forecast is for big breeze and rain; we are hopeful the rain holds off for a while, and we just have the wind.